Saturday Night Live sent senior staff at the Center for American Progress into a panic after a skit that criticized one of its top donors and a member of its board for their bank's role in the 2008 housing collapse, hacked emails show. The 2008 SNL sketch, which parodied a press conference by President George Bush, Speaker Nancy Pelosi (D., Calif.), and House Financial Services chairman Barney Frank (D., Mass. ), implied that the late CAP board member Marion Sandler and her husband Herb Sandler had made billions from the collapse. A chyron under their names identified the Sandlers, whose foundation has provided millions of dollars in financing for CAP, as "people who should be shot." The skit also parodied CAP donor George Soros under the chyron, "Owner, Democratic Party," and portrayed him as another bailout profiteer. In a series of emails following the sketch, dismayed CAP staffers, including its then-president John Podesta, concocted conspiracy theories about who might be behind the skit and discussed ways to enlist elected officials to push back on its portrayal of CAP donors. The emails were among thousands released in the last few weeks by the group Wikileaks after hackers believed to be acting in concert with the Russian government breached Podesta's email account. "Talked to Herb. They are obviosly [sic] upset," Podesta wrote of the skit. "Weird that snl should pick them out. They did soros too so maybe this is one of those right wing writers ala ABC 9/11." "At any rate, we should figure out a way to push back," he added. 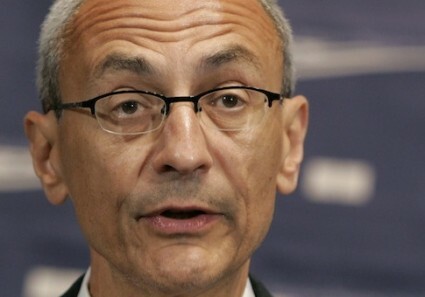 Podesta denied that the Sandlers had traded in subprime loans, but they were among the first to sell a type of adjustable-rate mortgage that the New York Times later dubbed "the Typhoid Mary of the mortgage industry." The Sandlers' 2006 sale of their Golden West Financial to Wachovia for more than $25 billion was widely seen as a primary cause of the bank's near-collapse two years later. One CAP staffer suggested that disgruntled Wachovia employees were trying to get revenge on the Sandlers by influencing SNL's programming. "I suspect there is a movement of wachovia employees who are angry and may be driving some of this," wrote CAP co-founder and executive vice president Sarah Wartell. CAP senior fellow Laura Nichols said she planned to enlist powerful congressional staffers to push back on the SNL skit. "I'm going to loop in pelosi peeps as her character intro'd them and they r her constituents," she wrote. Wartell said that she had reached out to Martin Eakes, the president of the Center for Responsible Lending, an advocacy group to which the Sandlers had contributed. The thread ended with Wartell calling a meeting for the following morning to plot strategies for countering their donors' satirical portrayal on a sketch comedy show.